This products maximum power 1800W, adopted super PCB layout design and super heat sink, heat dissipation good, since with a cooling fan interface, can also do Tesla discharge, generator voltage inverter, etc.. This induction heating circuit uses 12-48V low voltage DC power supply, maximum current 40A, the most highest power is 1800W. It can work continuously under the condition of good heat dissipation. 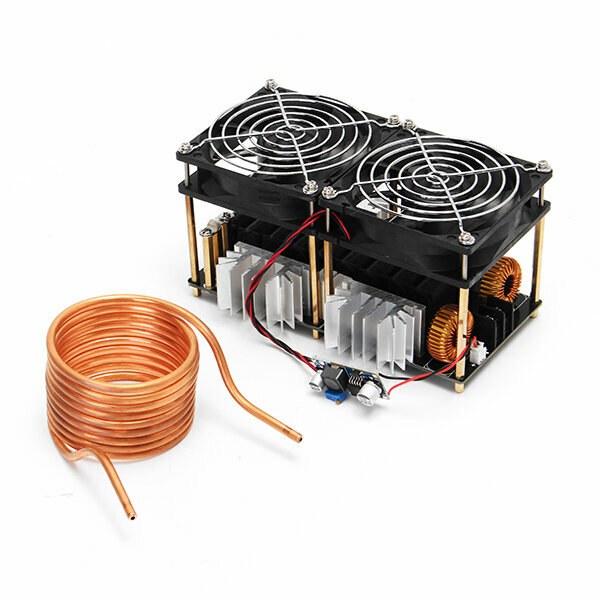 Due to its moderate power, it can be used by DIY players to give smaller players the parts can be treated by quenching, annealing and other heat treatment. You can also be melted with graphite crucible Kim, Silver, Copper, aluminum and other metal, heating evenly, is fast and very convenient. In this test, the maximum power is close to 1600W, and the maximum current is 35A. This product is available at under the condition of good heat dissipation, the utility model can work continuously for hours. Be careful not to overload. When the current is greater than 20A the power output voltage will be reduced. 1. The power of heating is very large, except that the plate and components are hot, and the heat of copper tube is very high. The buyer can prepare water cooling system separately, can buy a small water pump and 2 meters of inner diameter of 4mm rubber hose. 2. You must pay attention to when using switch power supply, because the high-power switching power supply usually have soft start function, namely the output voltage is slowly rising, and if the voltage rise to 10V before connected induction heating circuit will be caused by lacking voltage lead to circuit can't afford to vibrate, so that the two MOS tube conduction and burned components at the same time, so be sure to switch the power supply voltage stability and then access the induction heating circuit. 4. Although this drive plate can withstand more than 40A current, but it is recommended that not exceed 48V 35A to prevent accidents and damage. 5. Package comes with heating circle diameter is 60 mm, design voltage is 36V, if you use more than 40 voltage power supply shall be used for inner diameter 70 mm above diameter heating ring, water pump use 12V dc power supply, please use separate power supply voltage regulator module to avoid burn out fan and water pump. 7. If you find that the MOS tube fever, then the first thing to consider whether the power output meets the requirements. 10. Induction heating power is great, so fever is normal, be sure to do a good job of cooling. 11. Induction heating, the power recommended more than 48V 50A switching power supply. More than 24V power supply, then more than 20A power supply, the greater the voltage, the greater the current, the greater the heating power, heating faster.